Black print on grayish or yellowish paper. White, usually thin, paper is rare. † Gibbons  lists SG1-3 as "clear impressions, background sharp and distinct". SG4-6 are the same three stamps, but "worn impression, background worn and blurred". The first two plates were composed of 54 stamps - 18 of each value in three panes, each containing three horizontal rows of six stamps. A third plate of 54 30 reis, a plate of 60 30 reis, and two plates of 60 60 reis were sent to press. 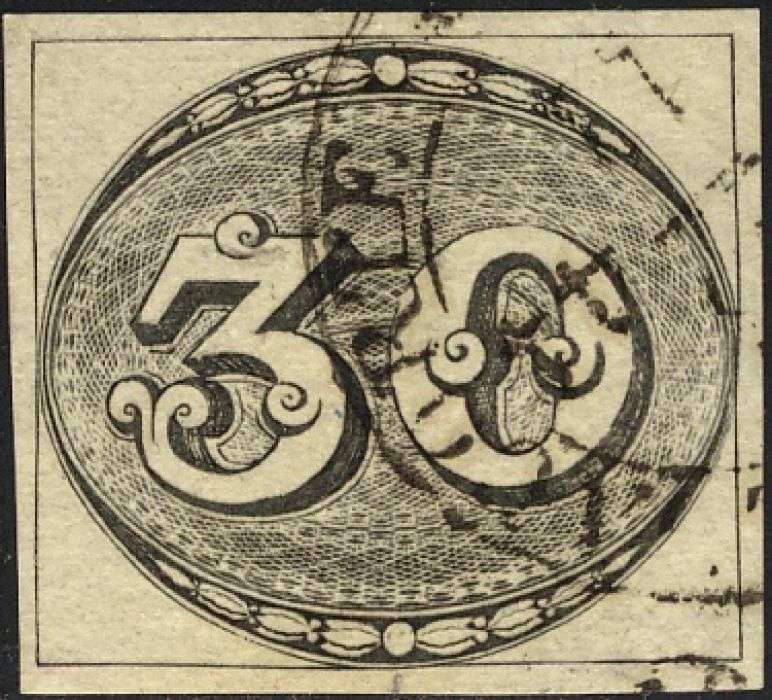 One reason for the scarcity of these stamps is that on March 30, 1846, the remainder of the Bulleyes (466,711 copies) were burned in the courtyard of the Brazilian Mint. Another reason is that they were frequently placed on the flap to seal the envelope and therefore were destroyed upon opening of the letter. 17 different kinds of forgeries are known. They were made by Spiro in 1864, Zechmeyer made 3 different forgeries in 1890, Erasmus Oneglia and Giovani Patroni in 1897, M.Mercier in 1910 (the predecessor of Francois Fournier) and Jean de Sperati in 1914 (only the 60 reis and 90 reis). It is not known who made the remainding forgeries. The stamps have earned the nick-name "Bull's Eyes", or "Olhos de Boi" in Portuguese.